The Superior Spider-Man Companion reminds you exactly who Otto Octavius's Spider-Man is – AiPT! You’ve got to hand it to Otto, he’s pretty damn proud of himself for getting into Peter’s body, and even more proud of himself for any success, no matter how minor, as the self-proclaimed Superior Spider-Man. Luckily, that makes him fun to write. A sometimes off-putting, but largely enthralling, hilarious and self-serious narration – offering lines like, regarding Thor: “God of thunder. Mouth breathing, muscle-bound, remnant of a dead civilization. Does he realize who he’s talking to?! Perhaps Parker enjoyed condescension” drives all of the stories here, speaking to how fantastically realized the character is as six writers pen Otto throughout the collection. While some stories, unfortunately the first one in the collection in particular, really focus far too much on Otto just repeating over and over that he’s Spider-Man now, for the most part they’re fun, character-focused affairs that lean into this new headspace. Even more fun? The absolute venom and vitriol he spews at his, or rather Peter Parker’s friends, which gets him into more than one tough situation – to thrilling, tense, and sincerely unique results that offer up yet more opportunities for that narration and dialogue. It’s almost like these writers are doing it on purpose, as if Otto is as fun a character to write as he is to read. More for us! While The Superior Spider-Man’s unique voice is the main draw of this companion, the tense, compelling nature of Otto’s secret and the near misses of having his identity, and crime, revealed is a close second. Luckily, this collection is primarily predicated on pairing him up with heroes who are always on the edge of uncovering just that. Which means two things: 1. 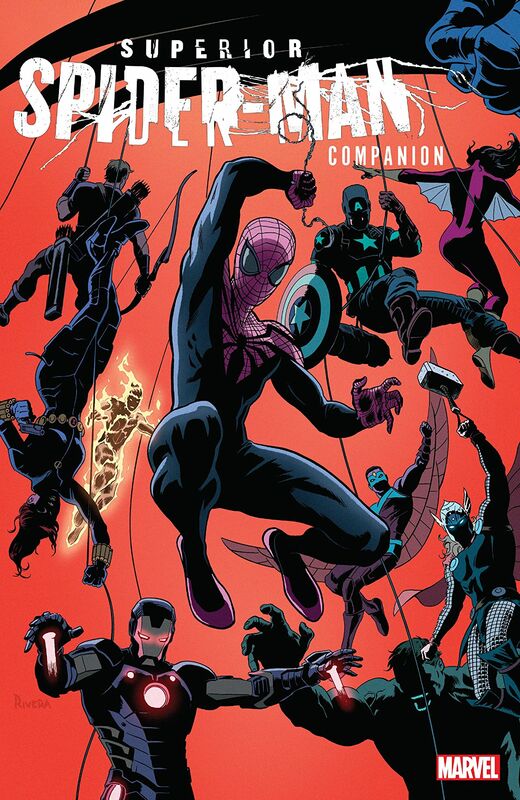 This is a good time to say you should NOT buy this book if you are not familiar with the mainline Superior Spider-Man book, as the collection here is primarily tie-ins and one offs that are part of a larger picture, and even then I found the layout and pacing of some of this illogical still. 2. Those near misses are just so, so good. One in particular, where Wolverine grabs Otto around the throat after a fist-fight that Otto strong-headedly started, almost ends with Jean Grey scanning The Superior Spider-Man’s mind to see if he is who he says he is. Another, sees Sleepwalker questioning Otto as to why all of his nightmares feature more Doc Ock than Spider stuff. These are smart, sensible character decisions that play out fantastically, time and time again on a smaller scale, but also serve a larger over-arcing plot well. Otto simply can’t stop himself from trying to one up the world but putting himself on a pedestal comes with a price. And lastly, as any good scientist would be, Otto is open to trial and error. More specifically, Otto is open to trying any number of various methods and means to get what he wants, or thinks New York and its denizens need (they would disagree, undeniably). This primarily takes shape in his experiment in, kind of brutally, reforming the Sinister Six in his own image as the Superior Six to mixed results, but also plays out in temporary team-ups with Thor, Namor, and even Kaine, who he admittedly detests. To that end, though, it means that there’s a lot of trial and error in the narrative and artistic efforts here as well. While some ideas really stick: the rising tension between Otto and Chameleon is a great example and that culminates in some of the best art here – Chameleon glaring at Spider-Man through broken glass, one half of his face spider, the other all murderous intent – others, like a nonsensical story about an Electro offshoot named Fulmina simply don’t. Thankfully, in a collection like this, nothing sticks around too long and you can power through to the next issue if you’re really not feeling it (I did this a few times – there are two or three painful arcs among many, many better ones) much like Otto does himself. Ultimately, knowing that this isn’t a collection for a Superior Spider-Man newbie, it’s a great, sometimes uneven, exploration of the character in a larger picture. The fights are fun if usually inconsequential, the events are as frustrating as ever (this is a big two book, after all) but over quickly, and the supremely, or rather…superior-ly realized voice and tact of Otto Octavius rings true across both narrative and artistic efforts in a way that’s just not touched on in other Spider-Man stories. A confusingly compiled, illogically organized collection that still showcases the best of what Otto Octavius has to offer as the Superior Spider-Man, this is fantastic collection for readers looking to compile the bulk of tie-ins in one place, but some of the stories and art leave a lot to be desired. Near every writer here really leans into the Superior Spider-Man character to great effect, love him or hate him, Otto is fun to read - and consistent. When it really hits its stride, some of the art here is unparalleled across spider stories, I particularly love the issue featuring a Chameleon prison breakout. The book's organization is illogical and detracting, even for seasoned Superior fans, it's hard to read this all the way through without cross-referencing. There's some big tonal shifts in art and narrative direction that could've been avoided entirely - the Daredevil story is one example of an issue that feels sandwiched between things completely unlike it.